"The Flash" was another good show cancelled way too soon (Thanks CBS!). Despite good ratings AND critical acclaim, it ended after only one season. It was an incredible loss to television, and one of the many reasons this was such a loss is because it robbed us of a great TV heroine in Tina McGee, played by Amanda Pays. Ms. Pays is one of the most unique British actresses I've ever seen. 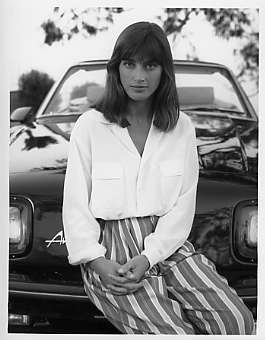 She's pretty, of course, but unlike most British actresses Amanda Pays is actually capable of smiling and having a sense of humor. This is what she brought to her character in "The Flash". Tina McGee was a scientist who worked for Star Labs and was secretly the sidekick for Central City's superhero, the Flash! Fiercely intelligent, Tina helped out Barry Allen a.k.a. The Flash more than most any other sidekick ever would. She basically created his costume and countless other devices in fighting crime. And just how many times did she end up saving his life? This isn't one of those "proving that women are smarter than men" shows that we see so often in film and television. Quite the contrary. Tina had her strengths, Flash had his. The Flash had incredible speed, the background knowledge of a police scientist, and the ability to beat people up. Tina McGee was not a fighter at all (in fact, she got knocked out a good many times throughout the series), but was smarter than most any person on the planet and very inventive. Plus she had a good sense of humor and kept the show light and realistic. I like Tina McGee AND Amanda Pays a lot!